Saturday morning, I found myself in déjà vu land all over again, as they say. I spent the morning standing in line outside the Washington Square Apple Store in Tigard, Oregon—standing in nearly the same spot as when I queued up for the release of the original iPhone in 2007. 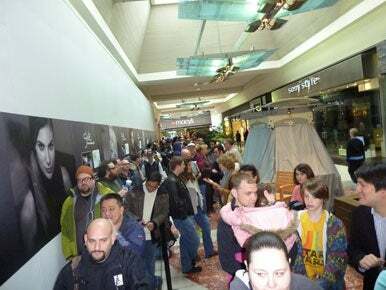 I was also there on a personal basis this time, where last time I was standing in line as part of my work for Macworld. On this occasion, though, I was buying an iPad for my new job with Many Tricks, to use for testing our first iPad application. 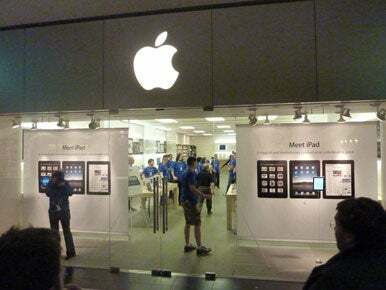 Preparations for the iPad’s 9 a.m. launch lasted through the night at this Tigard, Ore., Apple Store. When I arrived, the Apple employees had set up two lines—one for those with reservations, and one for the walk-ups. The reservation line was very short, as you’d expect. (Most people with reservations seem smart enough to know they can walk in any time before 3:00 p.m. to get their iPad). The non-reservation line was about 75 people or so when I arrived, and maybe double that by the time the store opened. From the start of my time in line, it was clear this particular Apple Store had plenty of inventory. People in the reservation line were told they could buy two even if they only reserved one, and they could also bump up (or down) in capacity if they wished. The Apple Store employees also surveyed the non-reservation line, asking each person which iPad they intended to buy. This info went into their iPhones, where (I assume) it then went back to the folks in the stock room to help pull inventory. As I waited, I talked to some of the employees about the process. They told me that preparations began Firday night, though the real work started with the “early crew” Saturday morning. In this case, early really means early—these folks arrived at 1 a.m. to redo the store’s interior. Most of the rest of the employees arrived between 5 a.m. and 7 a.m. to work on final store prep, crowd control, and “energy distribution” in the form of free coffee (and water) and donuts for those in line. The line grew outside the store Saturday morning, but the wait was nothing like the all-day wait for the original iPhone back in 2007. A minute or two later, it was my turn, and I was escorted in by my personal shopping assistant. After some consideration, I added the Apple case and a VGA adapter to my 16GB iPad, and proceeded to the counter to receive the well-packaged iPad. After that, it was credit card time with the personal shopping assistant, and I was out the door and on my way home. The whole process couldn’t have taken more than a few minutes. One thing that really stood out is that Apple clearly knows how to handle large crowds efficiently yet personably—at no time did I feel rushed, and I was even encouraged to spend some hands-on time with the machine (“Sorry, no time, kids waiting at home!”). Overall, picking up the iPad was well worth the minor hassle—I got the device much earlier than I would have via UPS, I got to talk to a bunch of similar-minded folks, and I even enjoyed a free donut and water on Apple’s dime, thereby lowering my iPad’s cost by a good $1.25 or so!